Lucille, Gene and I met at the Shoreland Park launch at 10 am. Lucille and I hadn't seen each other since April so we took pictures of each other. We launched at 10:12 and travelled 4.5 miles in 3 hours. I borrowed Gene's cameras battery as I had left mine in the charger and he has the same camera as me. It was a wonderful overcast day which makes for great photo opportunities. Oscar Scherer - South Creek- is a lovely area and as we padlled upstream we smelled the campfires for the campers along the river. 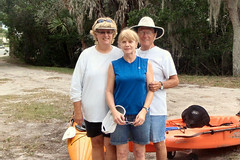 We saw many other kayakers-even an inflatable, as well as canoers with dogs in their canoes. I got a couple of good dog photos from the bridge at the nature center where we stopped for a stroll after we returned from passing the dam and managing to go a little further upstream. Gene and Lucille played some checkers at the Nature center and Gene enjoyed saying KING ME! many times. On the paddle back Gene And Lucille stopped for lunch but I headed back as I am on my special diet and was feeling a little weak. It was a little tricky finding the launch without my GPS or Gene as there are a lot of possible spots to enter to get back to Shoreland Park. I did take a wrong turn once but a guy trimming his palm tree told me I was just a little bit north of the launch. Fun day! Saw some birds but thats about it---although saw a small gator sunning here at home by a pond and a beautiful red tailed hawk that was on a telephone pole.